Confession - this is my 7th purchase!!! I can't stop!! The superior quality - the selections - the customer service - the prompt shipment - the secure packaging.... all top notch!!! I couldn't be more impressed!!! I love this personalized gift. I plan to purchase more. I gave it 4 stars instead of 5 because the picture that I sent is obviously more clear than the rest of the piece so it doesn't blend perfectly but it's still really great. My daughter is an art historian specializing in Renaissance art. 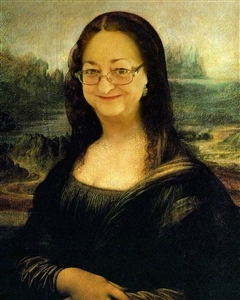 DaVinci is her idol and she HATES it whenever someone parodies the Mona Lisa, so, of course, we send her all the parodies we can find (evil laugh). Naturally we couldn't resist this opportunity to put HER face on the masterpiece. My DaVinci did an amazing job! After they sent the first proof I asked for a modification which they did quickly and well. The portrait arrived shortly thereafter in perfect shape in a strong shipping container. I was pleased to find that the portrait was printed on heavy, high quality paper, with a matte finish. Can't wait to frame this and give it to my daughter. She's going to kill me! Heh, heh, heh. I was a little skeptical when I first saw this online. But I sent a picture and before I had to commit, they sent me a copy of the picture. It came out perfectly. I was even more pleased when I got the finished product as it looks like a real oil painting. It was very easy and very fast. Definitely 5 stars for myDavinci! We've ordered several pictures from this company over the last 4 months and we're never disappointed. For this particular picture, the original picture uploaded did not look right when we looked at the preview - so they graciously waited for me to upload another picture. This company is the BEST to work with and I look forward to doing more business with them in the future. Got this as a gag gift for my dad. It turned out great, shipped quickly and was a big hit at the party. Definitely, would recommend MyDavinci! 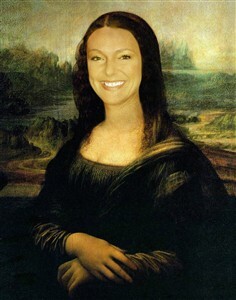 once again a very satified customer,so good I believe Leonardo davinci would approve. This was a present for my Mother in law who has everything she needs and wants nothing. She did get a good laugh ,and to my surprise hung it in her dining room. The quality was top notch ,and it came fairly quick. I'll be looking for more great works of art to superimpose my families faces to. A-Maz-ing! That's all I can say. Best gift I've ever given! I'll be back! Came out even better than expected, she loved it!! I got this done for my sister's 40th birthday. It was perfect! Her second grade school portrait reminded the entire family of Mona Lisa, and after all these years, this was the perfect opportunity to display it again. Looks so authentic and so funny ! My mother will be happy with this product. I bought this for Christmas thinking that the turnaround time would be long, and to my suprise I recieved my product in the very same week ! came out perfect. perfect gift for yankee swaps!!!! Just what I expected - great job! Draft work was done quickly and my changes were implemented well in time to give the gift. Completely satisfied!